With Easter fast approaching, I wanted to make a few little gifts for my Sunday School class. I teach pre-k and have two students – one of which is my daughter. I wanted it to be something with religious meaning. 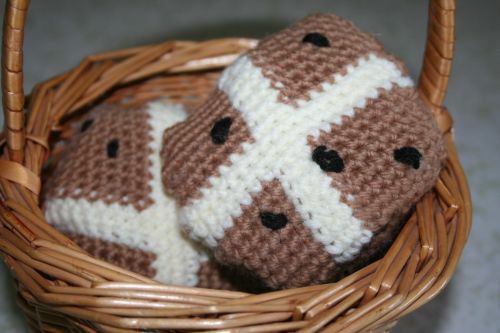 I decided to crochet hot cross buns. After not finding a crochet pattern, I decided to chart a cross and go from there. I tried a few different techniques and like binding off after each row the best. It gives the best definition of the cross. The downside is that you have a lot of loose yarn ends. I wrote down my pattern and hopefully it is somewhat legible. If anything is unclear, just let me know. Row 1 – SC into 2nd chain from hook and into the next 9 for a total of 10. Switch to cream color. SC into next three. Switch back to tan for the remaining 10 stiches. So your first row will have 10 SC in tan, 3 SC in cream, and 10 SC in tan. Bind off. Row 2-10- Join tan yarn in first SC of row. SC into first sc and into the next 9. Then switch to cream for next 3 SCs. Switch back for the last 10. Bind off *Repeat row 8 more times. A note about switching colors – On the last stitch of a color before swapping, pull through the color so you have two loops on the hook. Then yarn over with the new color and complete the SC. Row 11-13 – Switch to cream color and do three rows in it – binding off after each completed row. Row 14-22 – Join tan yarn in first SC of row. SC into first sc and into the next 9. Then switch to cream for next 3 SCs. Switch back for the last 10. Bind off *Repeat row 8 more times. SC 2, six SC into second chain from hook. Rnd 4-7(more or less) – Continue working in the round – adding six stitches until you have a piece about the size of the cross square. Join the two pieces with the right side facing out. Use a whip stitch. You will have to gather a little of the square at the corners to make it fit into the circle. Once you get most of it together, stuff it. Then continue to close it up. Take a little black yarn to make the embellishments at the top.